Hello again, did you enjoy the bonus cartoon from Friday night? You’re welcome. So here we are for another regular old Monday cartoon! There’s not much to tell about this one, I got the idea whilst sitting in a shopping centre food court eating my lunch and looking at Facebook on my phone. I happen to notice a chick next to me using her phone, now I don’t know about you, but I’m the paranoid type so I just assume the person next to me is talking about me on their phones, no idea why anyone would. But anyway this one day I thought it would be ironic if we were both on social media commenting on how we both are paranoid about the other talking about each other. As usual I wrote this idea down and stewed on it for a bit then brought it out last week and drew it. Did some more experimenting with combining real images with my cartoons this week, I did plan on taking a photo of a food court myself but I ran out of time so I turned to my old friend Google Image search! 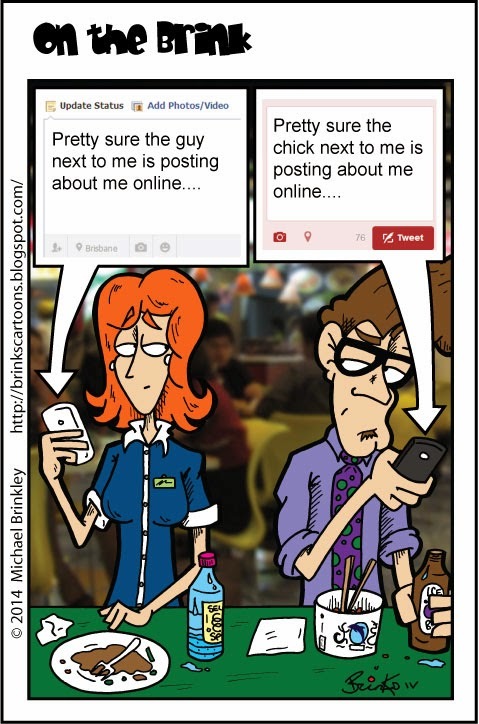 But those Twitter and Facebook windows are just screenshots of my own accounts, of which I have stuff all followers….join me www.facebook.com/brinkscartoons and twitter.com/Mr_Brinks you know you want to!